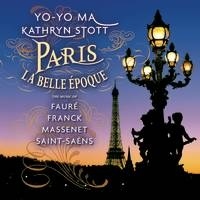 Yo-Yo Ma revisits Paris, the city of his birth, on his new recording Paris - La Belle Epoque. Ma and pianist Kathryn Stott perform transcriptions of the late Romantic music of Faure, Franck, Massenet and Saint-Saens. Yo-Yo Ma himself created cello transcriptions of three violin favorites - Faure's Violin Sonata in A, the "Meditation" from Massenet's opera Thais and Saint-Saens' virtuosic Havanaise.